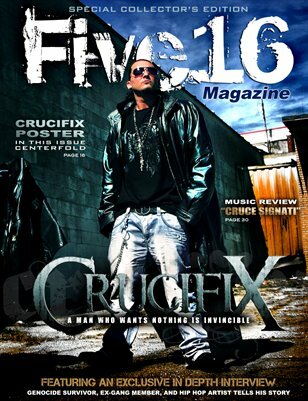 We are pleased to announce the release of the "Special 2 Year Anniversary Collectors Edition" of Five16 Magazine, featuring an exclusive in depth interview with Genocide Survivor, Ex Gang Member, and Hip Hop Artist Crucifix. This highly anticipated interview will be sure to motivate and inspire you as he speaks of his life struggles, trials, and ever growing Faith. Also included is a two page centerfold poster.